Comictastic is no longer under active development. If you feel the compulsion, you can purchase a registration code for $15, but be aware that there is no guarantee of further updates or support. "It's like TiVo for comic strips, and that's the most emphatic praise I can give it without using certain words that my editor assures me he has no intention of ever printing." "Your app has gotten better and better with each release, I'm really quite impressed with 2.0. It combines a good idea with good interface and a clever implementation." Comictastic automatically grabs your favorite comics from the web, giving you unprecedented comic reading efficiency. Save yourself hours of mucking through the vasty deadwood of unfunny guff and syndicated slag; invigorate your life with fresh humor-infused morsels assembled in one easy-to-use application. Support for 10 breathtakingly humorous comics built right in. Your favorite comic isn't supported? No problem! Just type in the URL and relax. No awkward plug-ins or HTML knowledge necessary. RSS and Atom support for comics that provide feeds (you can also use this feature to read news feeds, in a gimpy sort of way). Download comic archives to easily catch up on missed days. Save comics on your disk for later browsing using the handy built-in calendar. Scheduled refreshing—wake up to fresh comics, just like that! Simple, intuitive interface puts flimsy newsprint to shame. View your comics one at a time, or all at once, newspaper-style. It's your choice. E-mail comics to your friends using the built-in E-mail Comic feature, or just use drag-and-drop to do it your own way. 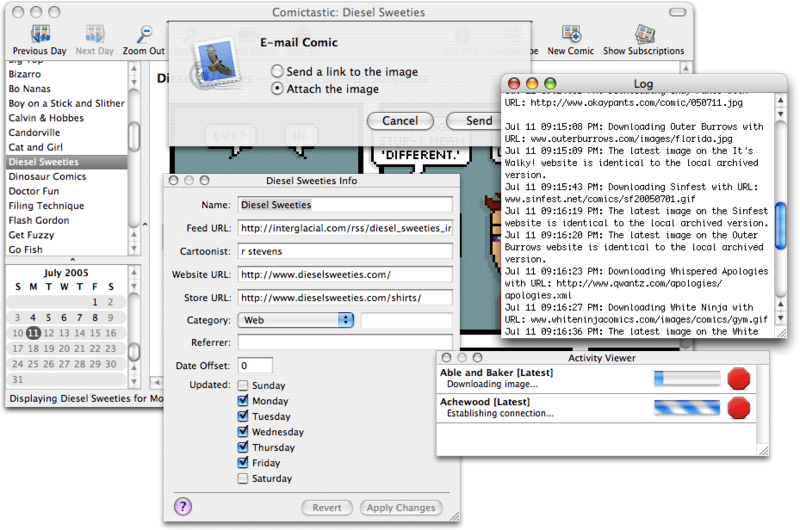 Export comic "definitions" (the files that tell Comictastic how to download a comic), or import definitions created by others, enabling you to instantly add support for new comics. Zoom in on those tiny, hard-to-read comics—or zoom out! The possibilities are practically limitless! The main window. ¡Que classy! The New Comic Setup Assistant. Add new comics in four easy steps! So many windows! What to do with them all? Aaaahh! Select multiple comics and see them all in one ginormous view, if you desire. Compiled as a universal binary to run on Intel Macs. Fixed a bug causing saved comics from versions prior to 2.3 to be inaccessible. RSS and Atom support. Some comics now provide RSS feeds — a superior method of comic delivery, both for the cartoonist, and you. Email Comic. Quickly send comics to your friends — or enemies. Interface improvements. The main window is much more glamorous now — kind of like those big kids with their "delicious" interfaces. Brand-new New Comic Setup Assistant makes adding new comics easier and less painful than ever before! The Edit Comic sheet has been replaced by a Get Info panel. New cache format and location. The cache is now stored in ~/Library/Application Support/Comictastic/Cache/, and is structured differently. Performance improvements, especially in launch time. Numerous other bug fixes and miscellaneous improvements. Comics can be grouped by their category in the main comic list now, via the Subscriptions menu. Fixed a bug where comics would sometimes stop downloading one minute after launching the application. Added a preference to customize the font size of the main comic list. Fixed a slew of memory leaks. Added scroll wheel support to the comic list. Comictastic now transmits a HTTP user-agent string when downloading files. Updated to the latest version of CURLHandle for HTTP support. Added scheduled refreshing in the Preferences. Fixed bug causing certain comics to be assigned to a date in the future, causing them to not refresh automatically. Note that this fix will take some time to fully take effect, since as long as the future-dated comics are still in the future, they will not refresh automatically. When adding a comic automatically, we skip images that have a small size specified in the HTML. This results in dramatic speed increases, especially for modem users. Archive downloading. You can download the archives of a comic by choosing "Download Archives" from the Comic menu. Improved error reporting. Instead of displaying a sheet hanging on nothing when the main window is closed, we display the error in an alert panel. Added Spanish localization, thanks to Jorge Salvador Caffarena. 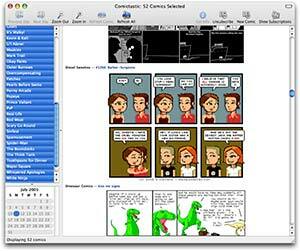 Greatly improved compatibility of the comic auto-finder. Fixed bug causing comics with only one image stored on disk to display an empty calendar. Comics are immediately downloaded after being created automatically, instead of requiring you to refresh them. The calendar is scrolled when you select a new date so that the new date is visible. If a comic can't be located on a website, it will be rescanned automatically, which should virtually eliminate "leading HTML not found" errors. Due to a limitation in Cocoa, a limited number of comics can be selected and displayed simultaneously. Now, instead of acting oddly when you select too many comics, an error is displayed. Modified the behavior of the Refresh All button to include known outdated comics in the refresh as well as comics that are supposed to be updated. Improved how we decide if a comic has been updated since you last viewed it. Moved the zoom level indicator to an image overlay that appears when you change the zoom level. In some cases, we no longer download images that has already been download, which can speed up Refresh All quite a bit. Implemented drag-scrolling in the image viewer. To drag-scroll, hold down Command and drag the image. Added log window containing useful debugging information. The main window can be closed without the application quitting. Mail.app-style activity viewer, allowing easier canceling of specific downloads. Menu items to toggle the main, log, and activity windows. Dock menu item to Refresh All Comics. Dock icon badging of number of unread comics with a preference to control. 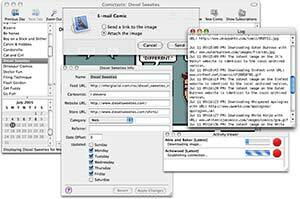 Added "Default image format" preference; affects drag-saving and regular saving default. The window splitters won't do that annoying proportional resize when you resize the window anymore. Fixed bug where the Date Offset wouldn't get copied over if you duplicated a comic. Updated support for several built-in comics, and added support for Tastes Like Gravel. A string of text can be downloaded and displayed along with the image. This feature is not accessible through the interface -- you must manually edit the definition file. See the Penny Arcade definition inside the application bundle for an example. 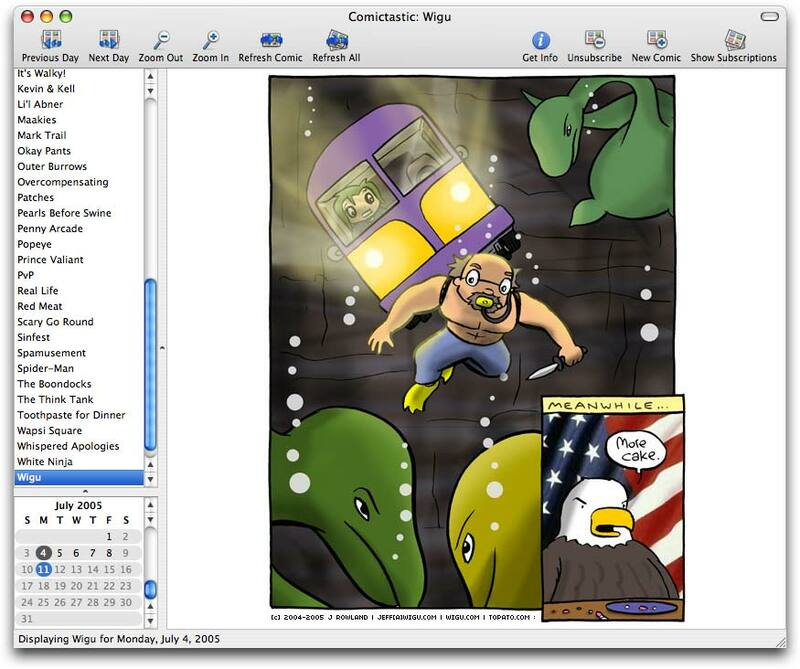 Preference to have the window automatically resize to fit the selected comic. The scroll bars on the viewer disappear when they aren't needed, instead of just disabling. Improved performance when switching between comics, especially when the calendar is hidden. The progress bar that shows when automatically adding a new comic now shows something useful. We can recognize dates encoded in an image filename, which means we can decide which date a comic image belongs to much better now. Improved date-switching performance when "Apply Date to All Comics" is selected. You can tab between the comic list and the viewing area, allowing you to select and scroll comics without touching the mouse. Fixed issue with old user-defined comics not being recognized. Manual importing of old user-defined comics is allowed. Complete rewrite, with all-new code. Downloading of multiple comics simultaneously. Automatic searching of web pages to add support for new comics. 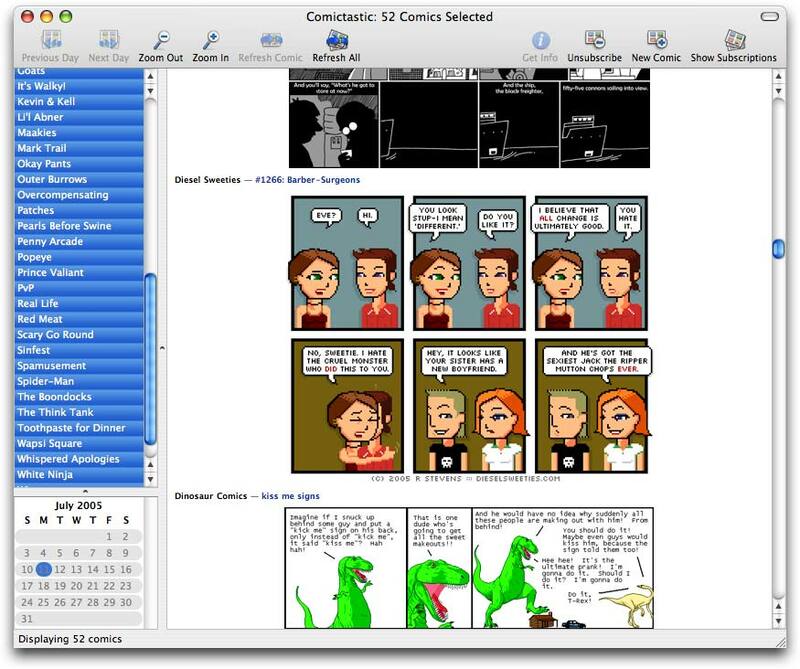 Greatly improved viewing, with unread indicators, reordering of comics in the list, ability to select multiple comics to aggregate them, and more. Pervasive contextual menus and drag-and-drop. Calendar to view previously downloaded comics. Manual refreshing of comics, as well as canceling of downloading. Many more things, too numerous to list.